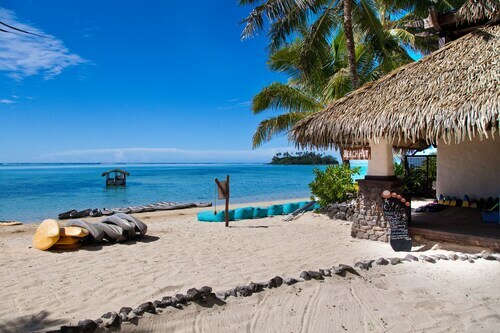 Experience the glittering blue lagoons, white-sand beaches and laid-back lifestyle of the capital of the Cook Islands. Located in the South Pacific Ocean, Rarotonga is the most populated of the Cook Islands and is home to their capital, Avarua. Known locally as “Raro,” the island offers palm-fringed beaches, bush walking, colorful festivals and snorkeling in warm, clear waters. The island’s circumference measures just 20 miles (32 kilometers) and is surrounded by a lagoon. 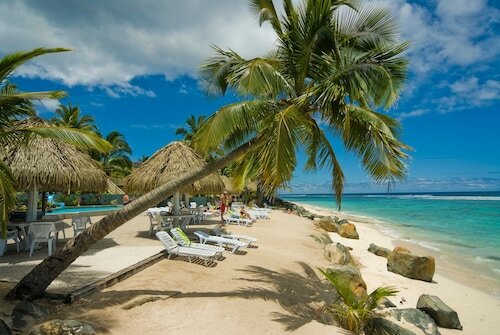 Tropical fish and coral abound in the warm, shallow waters. The calm waters of Muri Beach are perfect for beginner snorkelers. Rarotonga was formed by a rocky volcano, which collapsed to form a round island with small jagged peaks and hidden waterfalls. Visit Wigmore's Waterfall, which teems with wildlife. You can easily explore this and other natural attractions by bike or on foot. Another great opportunity to see the island’s flora and fauna is at the Maire Nui Botanical Gardens, which features much of the local vegetation. Visit the lively Punanga Nui growers market every Saturday before noon in Avarua village. Try the local cuisine, including seafood, and enjoy live music while buying souvenirs, locally-grown vegetables and flowers. Chickens and coconuts are just some of the obstacles often found on the roads of Rarotonga, and with not one traffic light on the island, you may find driving an eye-opening experience. You can also get around using the island’s bus service that travels both clockwise and anti-clockwise on the road circling the island. Bus drivers will pick up and drop off on demand. A round trip of the island takes about 50 minutes. Rarotonga International Airport is the main gateway to the Cook Islands. Boats traveling between the islands can be very infrequent – sometimes weeks apart, with generally no scheduled ferry service – so flying is recommended. The Cook Islands were once a British protectorate, with control later passed to New Zealand. Today, the islands are self-governing in free association with New Zealand. English is one of the official languages here. 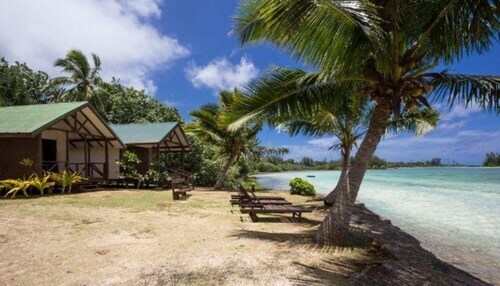 Many locals also speak Cook Islands Māori, often called Rarotongan after the capital island. 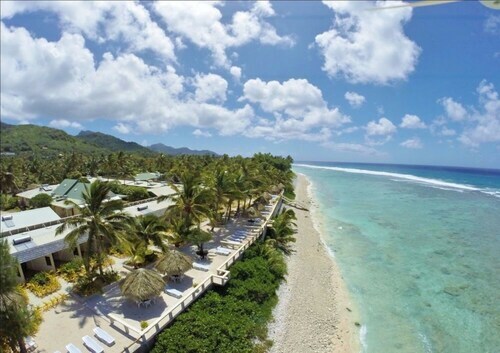 Swim with multi-colored fish or spend hours on a stretch of powdery white beach at one of Rarotonga's best coastal spots. Dive around nearby shipwrecks. Attend a service and chat with locals in this small and charming whitewashed church, which dates back to the mid 19th century. Through art and literature, learn about the history and traditions of the Cook Islands in a library and museum run by friendly local residents. 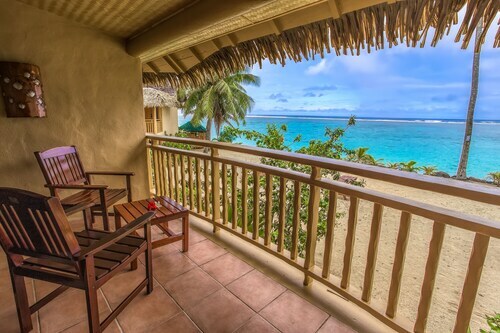 Stretch out comfortably on the bone-white beach while watching the sunrise over Rarotonga’s popular lagoon. Leave the bustle of the modern world behind and lounge on stretches of powdery white sand with the transparent Pacific Ocean at your fingertips. Join an interactive experience to appreciate the authentic educational and entertaining story of Cook Islands’ culture. Find Polynesian arts and crafts, lustrous black pearls and some of the best coffee on the island in this historic building. 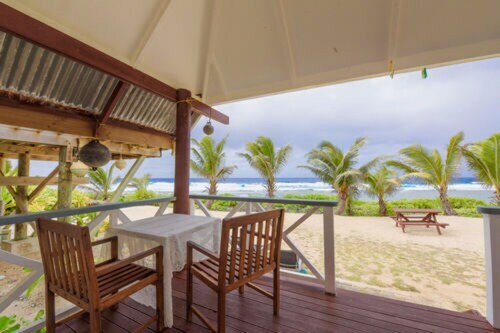 Located in Tapere of Rutaki, this beachfront resort is in the historical district and within 3 mi (5 km) of Aroa Beach and Wigmore's Waterfall. Rarotonga Golf Club and Tikioki Beach are also within 6 mi (10 km). 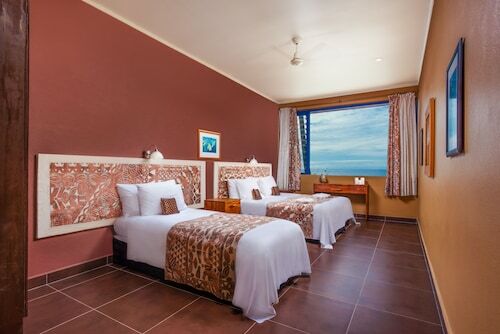 Nestled on the beach, this Matavera hotel is within a 15-minute walk of Muri Lagoon and Muri Beach. Koromiri and Te Vara Nui Village are also within 1 mi (2 km). Sat., 17 Aug. - Fri., 30 Aug.